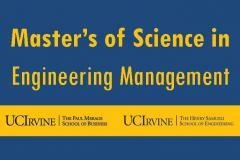 UC Irvine’s The Henry Samueli School of Engineering and The Paul Merage School of Business have joined together to offer a new Master’s of Science in Engineering Management (MSEM) program beginning Fall 2012. Applications are currently being accepted on a rolling basis through July 1, 2012. The highly focused MSEM program integrates the extensive resources of both the engineering and business schools, to provide the cutting-edge engineering skills and proven, real world business practices that engineers need to become effective leaders and industry innovators. Empowered with this dual skill set, engineers are able to lead cross-functional teams and successfully bring innovative projects to market. UC Irvine’s MSEM program is designed to be completed in one full-time year, with a minimum of 17 courses (45 units) beyond a B.S. in engineering or an allied field. For more information about the programs and details on how to apply, visit eng.uci.edu/grad/programs/em, or contact UC Irvine’s Graduate Student Affairs office at 949.824.4334 or via email at gradengr@uci.edu. The Henry Samueli School of Engineeringat UC Irvine is at the forefront of education and research in the engineering disciplines that will shape the future of the nation and the world. With rapidly expanding academic programs and a growing number of faculty and students, the Samueli School is becoming a powerhouse for innovative engineering education and the development of tomorrow’s advanced technologies. Through an integrative and cross-disciplinary educational experience that blends fundamentals, research and hands-on experience, we train future leaders in the engineering profession. Working in partnership with state and federal agencies and industry, the School promotes the transfer of research to applications that benefit society. The School’s faculty members are scholars and leaders in their disciplines and have achieved worldwide honors and recognition for their pioneering research and dedicated teaching. More than a third of our faculty members are Fellows in professional societies and 10 have been elected as members of the National Academies. For more information, visit www.eng.uci.edu. The Paul Merage School of Businessat UC Irvine offers MBA and other graduate programs – plus Ph.D. and undergraduate business degrees – that deliver its thematic approach to business education: sustainable growth through strategic innovation. It graduates leaders with the exceptional ability to help grow their organizations through analytical decision-making, innovation and collaborative execution. Six Centers of Excellence and an Executive Education program provide numerous and varied opportunities for students and the business community at large to enhance their education experience and update their professional expertise. The Merage School consistently ranks among the top 10 percent of all Association to Advance Collegiate Schools of Business(AACSB) accredited programs through exceptional student recruitment, world-class faculty, a strong alumni network and close individual and corporate relationships. For more information, visit merage.uci.edu.